Sacrament of Reconciliation: Axminster – Sunday 8.30-8.45am, Seaton – Saturday 5-5.15pm or by arrangement. Holy Places of Palestine Collection: A collection will be taken on Good Friday in St. Michael and St. George Church, Lyme Regis, for the Holy Places of Palestine. Please give generously, your support is appreciated. The Local Governing Board of St Mary’s Catholic Primary School Axminster are seeking to appoint a Foundation Governor. The role is interesting and rewarding. A particular knowledge of interpreting data would be helpful but not essential. You would be part of a well-motivated team of volunteers who give of their faith, experience and knowledge for the support and development of our Catholic school community. Please contact me if you are interested but would like to know more. Details are: Chair@stmarysaxminster.devon.sch.uk or Theresa Dicker 01297442865. Rosary Group During the month of May, St Mary’s school intends to focus on devotion to Our Lady. Mrs Mannix and Fr Anthony would very much like this to be as far as possible, a shared journey between school and parish. The parish hopes to start a Rosary Group which would meet every week during May, perhaps after Tuesday or Friday Mass in Axminster. The group would pray the Rosary and would be led by a parishioner. The intention would be to hold before God, with the help of Our Lady, the life of the children, the Staff and the work of the school. Towards the end of May there would be a joint meeting of school and parish in order to bring together all those prayers and intentions which have united us. Please let Fr Anthony know if you would like to be involved with this. Axminster Office Hours: Monday 9am – 2.30pm, Tuesday 9.30-3pm Wednesday – Friday office closed. 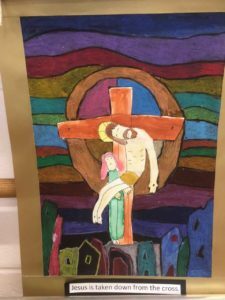 St Marys, Axminster is currently displaying the talented art work produced by St Mary’s School Students. Do come and see!